All anglers know that carp are suckers for bread crust fished on the surface in the summer, but it is often a very underused bait at all other times of the year. Here we show you how it can be used to catch more carp just off the bottom of stillwaters at any time of the year. Bread crust and bread flake, by their very nature, are buoyant baits. So they are perfect for use just off the bottom, above any silt or blanket weed. 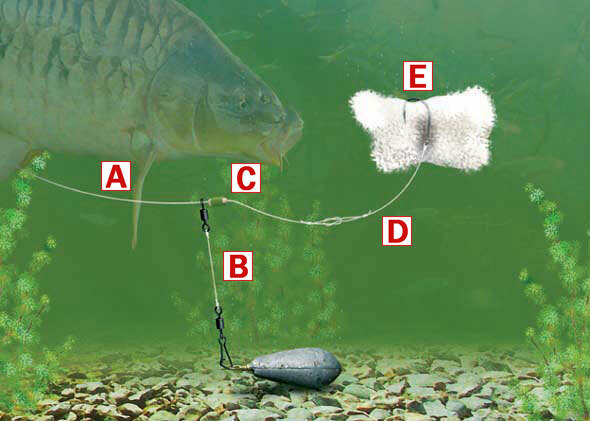 This is a really simple rig to create, it’s virtually tangle-free, and it’s really productive too with many carp being caught in pleasure and match sessions over the past season. A Your mainline needs to be quite substantial as there is a high chance that you could encounter some very big carp. We would suggest using 6lb as a minimum. B In order to ensure that the rig is as resistance-free as possible, it’s best to use a short length of line between your leger bomb and your swivel. A 4ins length of strong mainline will be ideal. At one end tie a large swivel, and at the other tie a snap link swivel as this will allow you to chance your lead in seconds if you need a different weight of lead to cast further. C A leger stop is the ideal item to use to prevent the swivel from slipping down to the hook. If you do not have any leger stops, use a small split shot. D Your hooklength shouldn’t be too long. Around 6ins is about right. Again you will need to choose a lien that’s strong enough for the carp, so 6lb is a good starting point. E A large hook is paramount here. Something like a size 10, 8 or even 6 could be used as the swollen bread will help mask the hook once it’s submerged. A note worth mentioning here is that you will need to cast very gently to prevent the bread coming off the hook. Use a gentle sweeping motion to launch the rig, rather than a punch.